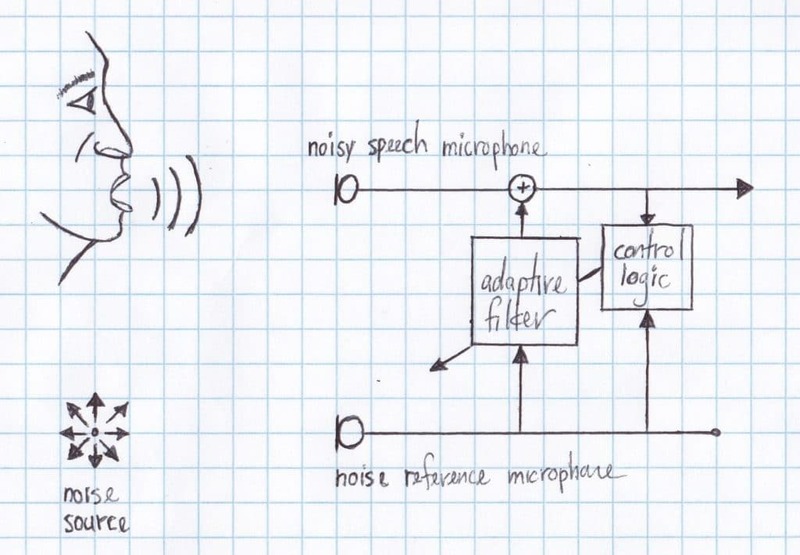 As it was discussed in Noise Cancellation Microphones, the addition of a second microphone provides the opportunity to significantly improve the signal to noise ratio (SNR) of a noisy speech signal. A noise cancellation system uses a noise reference to sample the noise of the acoustic environment, an adaptive variation of this noise reference signal can be subtracted from the original microphone to remove the noise and enhance the desired speech signal. In theory, the desired speech must not be present in noise reference to prevent the desired speech signal from being canceled out along with the noise. However in practice, the speech signal will be picked up by the noise reference microphone. With proper placement of the microphones and some control logic, cancellation of the desired signal can be prevented. The noise reference microphone must be placed closer to the noise source than the noisy speech microphone, and the noisy speech microphone must be placed closer to speech source than the noise reference microphone. It may seem like common sense, but it is absolutely critical for proper performance of an adaptive noise cancellation algorithm. This placement is crucial because it provides enough known information about the system that control logic for the adaptive filter can be implemented. When the speaker is talking the speech signal will have greater amplitude in the noisy speech signal than in the noise reference. When this is detected, adaptation of the filter must be frozen. Those familiar with echo cancellation, this acts very much like the double-talk detector logic. With adaptation frozen, the adaptive filter will not cancel out the speech signal when it is present in the noise reference.